Congratulations to Starkville High School for winning the Mississippi BEST (Boosting Engineering through Science and Technology) Robotics championship – again! Not only did Starkville High School win the overall championship for a second consecutive year, they dominated every objective category of competition. Starkville High School has become the premiere robotics program in Mississippi. This success is part of the larger story of the academic excellence in the Starkville School District and should be a point of pride for our community. Kudos to Denise Adair and April Dill, teachers at SHS’s Millsaps Career and Vocational Center, who volunteered untold hours after school to prepare the SHS/Millsaps Robotics Team for its championship run. In only its third year of existence, the SHS/Millsaps Robotics Team is developing quite a reputation as a robotics powerhouse. To finish first, the team defeated 25 other schools, including the Mississippi School for Math and Science, Tupelo, Madison Central, and all other area schools in Starkville. The SHS team, called the RoboJackets, won the BEST Award, which goes to the overall champion. To win this award a team must score the highest aggregate points in several categories of competition including engineering notebook, marketing presentation, booth exhibit display, spirit and sportsmanship, and robotics competition. In addition, the RoboJackets won the BEST Robot Award for scoring the most points, which involved constructing simulated computer components. 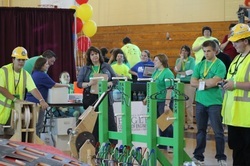 Last year, the SHS team came in second in this category, but they improved to first place this year. Winning the overall award and the best robot award would be impressive enough, but the RoboJackets of Starkville High School also garnered two more awards. They won the BEST Marketing Presentation Award, which is given to the team that most effectively demonstrates the design and manufacturing process, marketing strategies, use of available technology, and for the overall quality and professionalism of their presentation. The RoboJackets also won the Founders Award for Creative Design, which is presented to the team making the best use of the engineering process in consideration of offensive and defensive capabilities in machine design. This is the second consecutive year that SHS has earned this award. Starkville High’s RoboJackets are led by three seniors: Kelley Mazzola, who acted as spotter for the drivers, Robert Bowden, the chief mechanic, and Will Klein, who documented the engineering design process by writing the engineering notebook. The RoboJackets earned the right to enter the Regional Championship in Auburn, Alabama, where they will compete against the top 60 teams east of the Mississippi River from Connecticut to Florida. Students in the Starkville School District regularly compete well against the best in the state and the nation in academics, athletics, and the arts. The second consecutive Mississippi BEST Robotics championship continues this fine tradition of excellence.